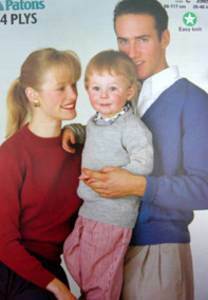 Sale price matching family and unisex knitting patterns for men, women and children including patterns for cardigans, sweaters, waistcoats, tops and more in 4 ply, DK, aran, chunky from top brands inc Sirdar, Wendy, Patons, King Cole, Sublime, Twilleys, James Brett etc. 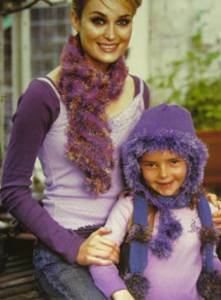 Cosy and trendy accessories in Sirdar Squiggle superchunky, to fit from age 4 to adult. Scarf and hood with pompoms, scarf with pockets, textured scarf with pompoms and easy broad rib cowl/ snood. 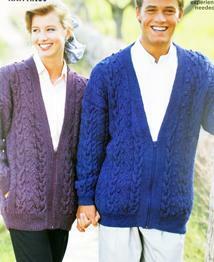 Sirdar zip-up cardigan with hood, or button up, with embroidered flowers. To fit 56-102cm (22-40in). DK yarn - 20st/ 29 rows to 10cm, 4mm needles. 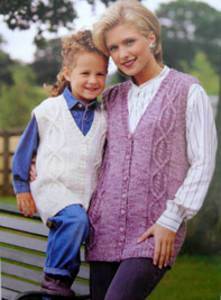 Sirdar mother and daughter tops with keyhole decolletage knitted in chunky yarn to fit sizes 71-97cm.. 14sts / 19 rows to 10cm (stocking st), 5.5mm needles. 3 x 50gm balls. 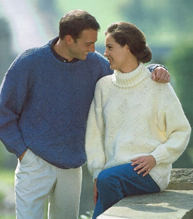 Matching polo and stand up neck jumpers knitted in Sirdar Snowflake chunky yarn. To fit 71-97cm. 14sts / 19 rows to 10cm (stocking st). 5.5mm needles. 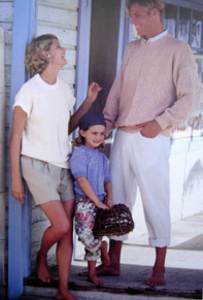 King Cole family sweaters in 1, 2 and 3 colours in textured st, plus hat and scarf in DK yarn. To fit 71-117cm (28-46in). 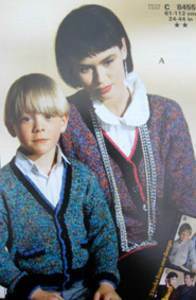 Classic moss st sweater plus jacket with collar and hooded top, from King Cole, in chunky yarn. To fit 71-117cm (28-46in). 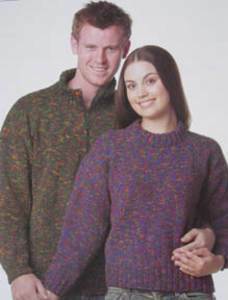 King Cole sweater with hood or zipped collar with reverse st st body, in chunky yarn. To fit 66-112cm (26-44in). 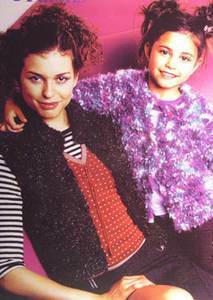 Patons bodywarmer and cardigan in superchunky yarn for girls and women. Fits 61-97cm (24-38in). 11st / 15 rows to 10cm, 8mm needles. 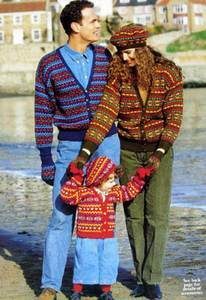 Patons fair isle cardigans for the family, plus matching accessories - gloves and tams (berets). Knitted in DK, 22st/ 30 rows to 10cm, 4mm needles. To fit 56-112cm (22-42in). 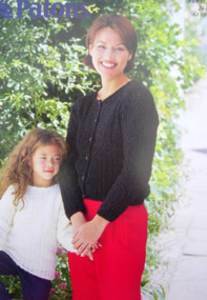 Patons v-neck cardigan with pockets for the whole family, can be knitted in one colour or with contrast border. To fit 61-112cm (24-44in). Knitted in DK, 22st/30 rows to 10cm, 4mm needles. 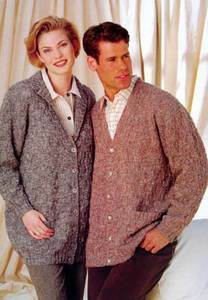 Patons sweater with rollover collar and cardigan with easy all over cable design. Knitted in DK. To fit 66-102cm (26-40in). 22st/30 rows to 10cm, 4mm needles. 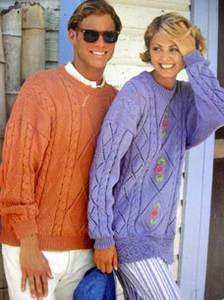 Patons cardigan and sweater in simple lace stitch, knitted in DK. To fit 61-107cm (24-42in). 22st/30 rows to 10cm, 4mm needles. 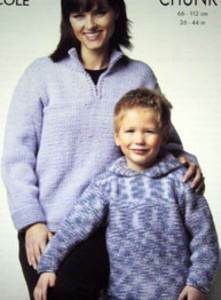 Patons ribbed zipped jacket with pockets to fit sizes 61-117cm (24-46in) knitted in aran yarn. .
Patons classic raglan V-neck or crew neck sweaters knitted in 4ply: sizes 66-117cm (26-46in). 28st/36 rows to 10cm, 3.25mm needles. 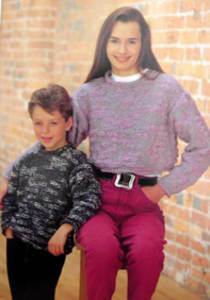 Patons easy crop sweater in chunky yarn, featuring rollover neck, waistline and cuffs. To fit 61-97cm (24-38in). 15st/20 rows to 10cm, 6mm needles. 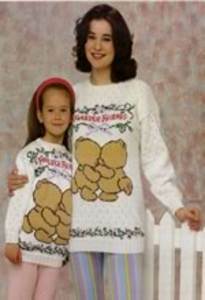 Patons charted design featuring Forever Friends, in children and women's sizes from 61-107cm (24-42in). Knitted in DK yarn, 23st/31rows to 10cm, 3.75mm needles. 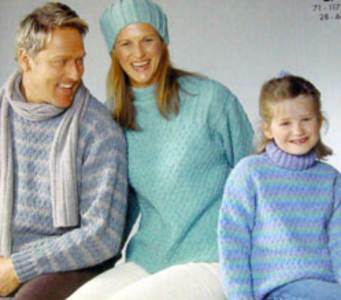 Patons panelled family sweaters and tops in DK, with colour contrast option. To fit 61-107cm (24-42in). 22sts / 30 rows, st st, 4.mm needles. 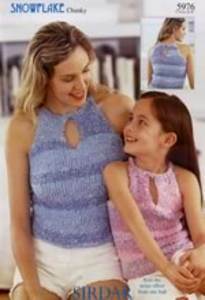 Patons quick and easy sleeveless top or slipover knitted in reverse st st in chunky yarn. To fit 61-97cm (24-38in). 15st/20 rows to 10cm, 6mm needles. 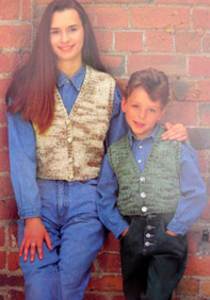 Patons quick and easy waistcoat with pockets, knitted in chunky yarn. To fit 61-97cm (24-38in). 15st/20 rows to 10cm, 6mm needles. Patons long line waistcoat with cable design, knitted in DK. To fit 66-102cm (26-40in). 22st/30 rows to 10cm, 4mm needles. 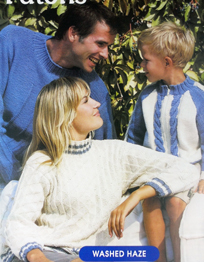 Jaeger sweaters in DK or cotton DK, featuring trellis cables. To fit 76-112cm (30-44in). Tension 23st/31 rows to 10cm, 3.75mm needles. Patons tunic and sweater with cables and diamond panels in lace or moss st. Knitted in DK, to fit sizes 76-81cm (30-44 in). 22st/30 rows to 10cm, 4mm needles. 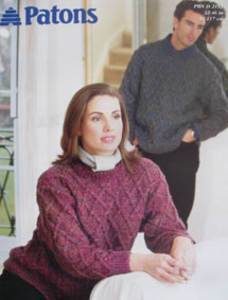 Patons sweater with a cable yoke, waistcoat allover fairisle pattern. Fits 81-117cm (32-46in). 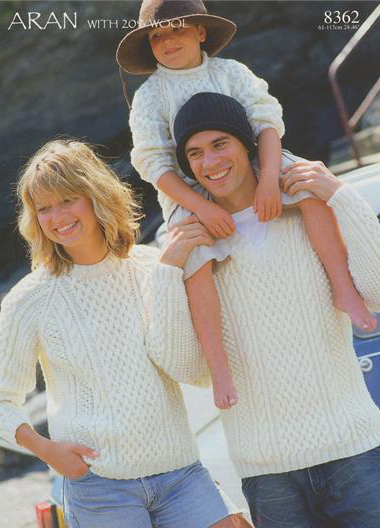 Knitted in DK. 22st/30 rows to 10cm, 4mm needles. Patons cable sweaters in aran wool, to fit 76-112cm (30-44in). Tension 19st/ 25 rows to 10cm, 4.5mm needles. 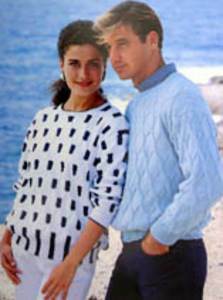 Patons classic long sleeve polo shirt to fit 76-112cm (30-44in). Knitted in DK 22st/30rows to 10cm, 4mm needles. 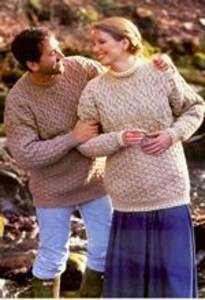 Patons trellis pattern sweater in aran yarn to fit sizes 81-117cm. 19sts / 25 rows to 10cm, 4.5mm needles. 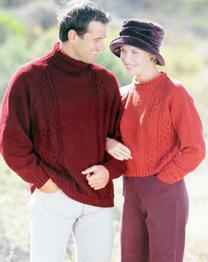 Patons DK cabled sweaters, to fit sizes 76-112cm (30-44 inches). 22sts/30 rows to 10cm, 4mm needles. 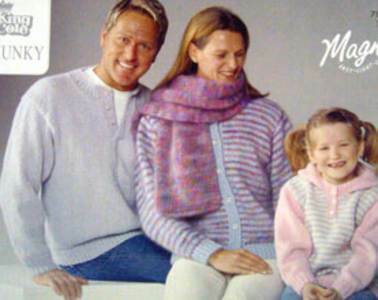 Patons poster pattern with 2 cabled sweaters and a textured stitch hooded coat. Knitted in aran, 19st/29 rows to 10cm over pattern, 4.5mm needles. To fit 81-107cm (32-42in). 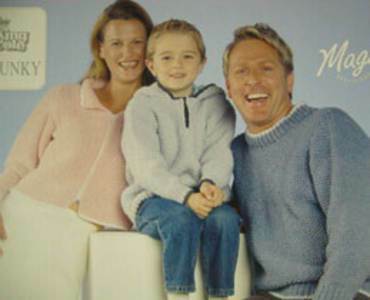 Patons cardigan with or without collar knitted in DK, to fit 81-117cm (32-46in). 22st/ 30rows to 10cm, 4mm needles. 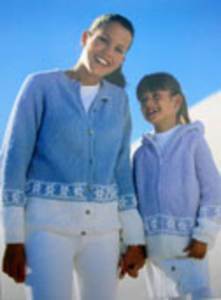 Patons reverse stocking stitch jacket to fit 81-117cm (32-46in). 19st / 25 rows to 10cm, 4.5 needles.